Let’s try a little experiment. If I say “love and jewelry,” what image flashes into your mind? Considering the day and age, probably a diamond engagement ring or gold wedding band. But while these specific traditions are less than a hundred years old, people have been expressing their love through jewelry for, well, probably forever. And the kinds of jewelry they’ve used have been as varied, and as lovely, as love itself. So with Valentine’s Day just around the corner, here are a few examples of popular love tokens from throughout history. 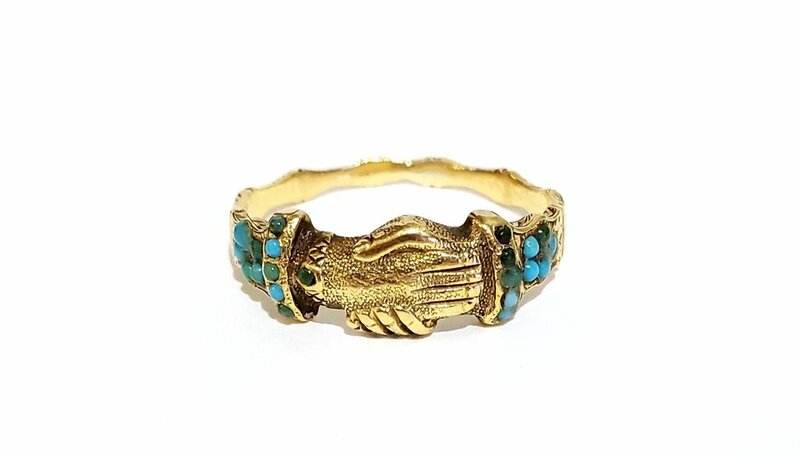 Fede rings, depicting clasped hands, are one of the oldest forms of jewelry, dating back to Roman times; Europeans revived the style in the twelfth century, and their period of greatest prevalence lasted through the eighteenth (which is when ours is from! ); today, the related claddagh ring is more commonly seen. The name comes from the Italian phrase mani in fede, meaning hands clasped in faith, and they were held to represent love, friendship, or betrothal. This sweet example seems to show a man’s hand tenderly holding a woman’s, identified by her tiny bracelet. Giardinetti jewelry takes the shape of a bouquet, often in a vase (giardinetti is Italian for “little garden”). These rings and broaches, set with colorful gemstones or, like ours, with diamonds, were particularly popular during the Georgian era, and often traded by friends and lovers. Think of them as the jewelry equivalent of a bouquet of flowers! Snakes have long been a popular jewelry motif, but not everyone realizes that they’re a symbol of love! Eternal love, to be precise. While dating to ancient times, serpent jewelry enjoyed a massive resurgence during the nineteenth century after a young Queen Victoria received a snake engagement ring from her beloved Prince Albert. These snake rings do indeed date to the Victorian era, and put a particularly romantic twist on the style (no pun intended) with their designs of two snakes intertwined. Lockets have been gracing necklaces, and sometimes rings and brooches, for centuries; then as now, they’re treasured for their ability to hold images or small items evoking someone beloved to the wearer. Before the dawn of photography, they were most likely to contain a miniature painted portrait or, as famously depicted in Wuthering Heights, a lock of hair. Starting in the mid-nineteenth century, some larger examples held daguerreotypes, an early form of photograph. With the advent of modern photography techniques around the turn of the century, however, the ability to take, reproduce, and resize pictures became accessible to the masses. As more and more people possessed photos of their loved ones, the locket reached even higher levels of popularity as the perfect way to keep them close. Beautiful, durable, and intimate, it’s easy to see why people have used jewelry to say “I love you” for centuries, and in so many imaginative ways! We’re just grateful that, all these years later, these pieces keep a whole history of love alive. It’s clear that love and jewelry are, in themselves, a match made in heaven. The life of any piece of jewelry begins with an idea. Before metal can be cast or stones can be set, a designer must sit down and create an image of what the final product will look like. It’s not often we get the chance to come face to face with this phase of vintage jewelry production, which is why Gray & Davis is delighted to display, for a limited time, some Cartier hand sketches dating from 1930 to 1950. Created by house designer Edouard Blondeau, these beautiful gouache images of necklaces, rings, bracelets, broaches, and earrings are works of art in themselves. Then, as now, Cartier was one of the most famous and admired jewelry houses in the world, its work regularly worn by royalty and celebrities. The artisans it employed would have been at the top of their professions, as these illustrations certainly affirm. The designs are elegant and luxurious, full of ornate metalwork and precious stones. In many cases, they cleverly take inspiration from the natural world. Even more than the content of these illustrations, however, it’s their form that makes them so rare. While plenty of designers still sketch out their ideas, a detailed rendering is just as likely to come from a computer program. And even when done by hand, contemporary sketches just don’t measure up to the intricacy and skill displayed here. The bright color, dimensionality, and impressionistic details of these drawings provide a sense of a finished piece’s substance and luster. 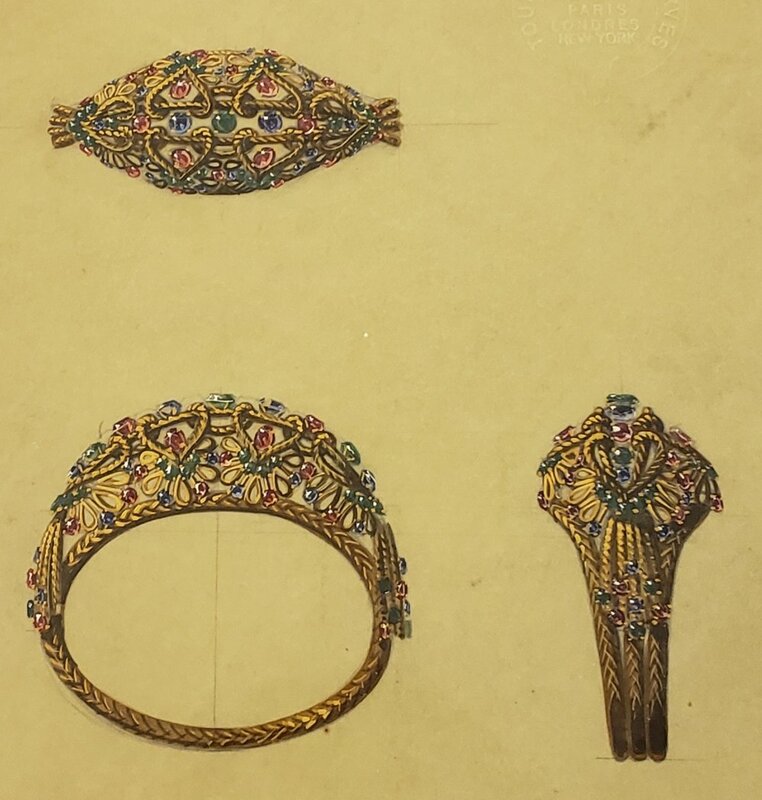 Looking at them, it seems like the depicted jewelry leaps off the page. This is all the more special because it’s entirely possible that these images do represent the final form of these designs—all we know is that they were never incorporated into the official Cartier line. This leaves two possibilities. Each sketch may have been presented as a potential piece for a Cartier collection, and never put into production. Or, alternately, it may have been designed as a custom piece for a client, who may or may not have had it created. Records don’t indicate one way or the other. We do know that these pieces were created in Cartier’s home city of Paris. These sketches, like all made at the house, bear a company watermark; the order of the cities listed therein changed according to where a sketch was made, with the origin as the first location listed. Gray & Davis invites you to come visit these sketches in our West Village store—you may even be inspired to take one or two home yourself! And, the next time you look at a piece of jewelry, think about the process it took to get here—and, particularly if it’s an older piece, the additional beauty it might have generated on the way. We’re always pleased when jewelry reveals some of it secrets through hallmarks, maker’s marks and engraved details. However, some jewelry are meant to keep secrets; artisans have built compartments to protect the wearer’s valuables and tokens of significance, and encase them in some seriously fabulous materials. 19th Century Etruscan Revival coach covers, from the Gray & Davis archives. Coach cover with the old mine cut diamond earring it encased, from the Gray & Davis archives. Fashionable and functional in the 19th century, “Coach covers” are attachable orbs that cloaked valuable earrings to protect the wearer in transit (we assume from villainous highwaymen). Once the wearer arrived at her destination, she could remove the covers and let her diamonds out. 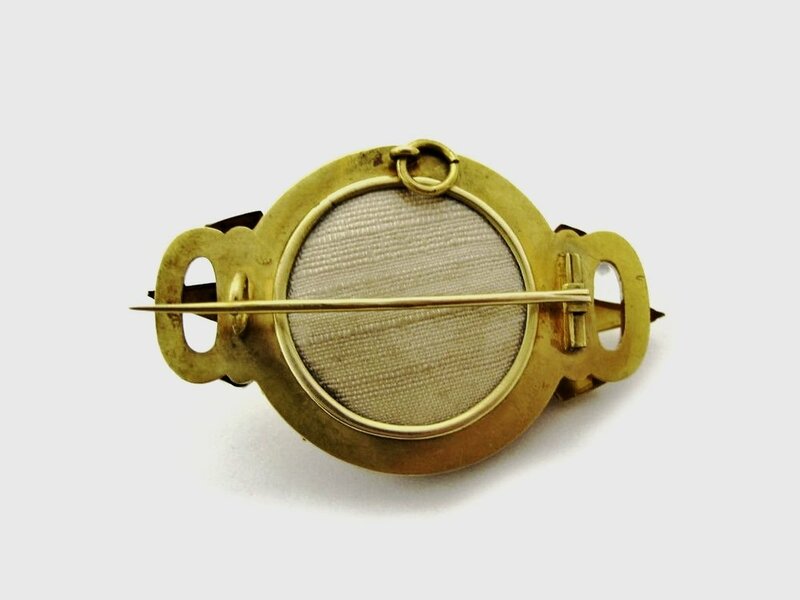 A 15K gold brooch pendant with its original pin and catch made c. 1860. The brooch pendant's secret locket compartment, now fitted with a piece of brocade. 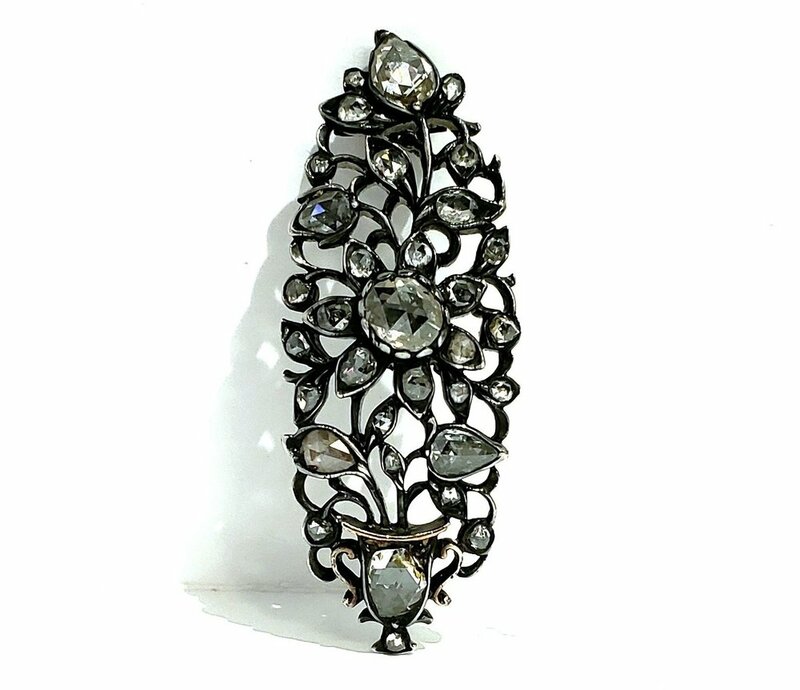 Jewelry that incorporated a loved one’s hair became popular in the seventeenth century and remained in fashion until the end of the nineteenth century. Pieces could be given as both a sentimental gesture (Queen Victoria gave hair jewelry throughout her life) or included as part of mourning jewelry to further personalize the token of remembrance. Jewelry with a glass plate built in, as well as some daintier antique lockets, most likely held beautifully woven hair; period jewelers were skilled at braiding and working it into compartments of brooches, pendants and rings. A 15K rosy gold locket ring with a buckle design and hand engraving, made c.1830. Buckle ring hides woven hair around the band's center. Small ring compartments may have held other secrets besides hair. Rings crafted with a small lidded compartment for herbs, or something more sinister, are mentioned in ancient texts. 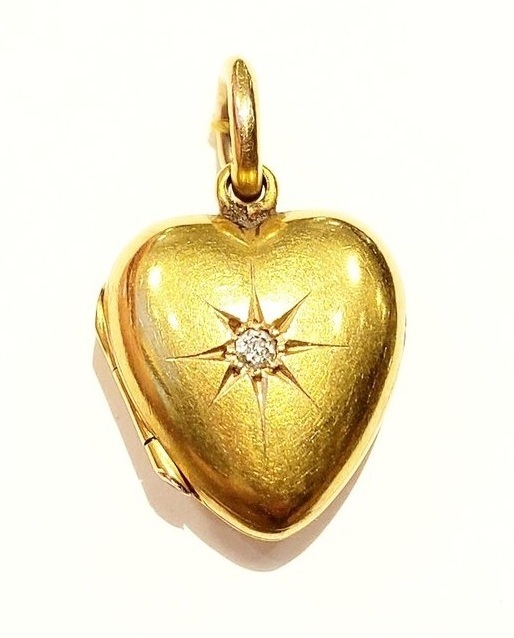 Famous locket ring wearers included Elizabeth I and members of the powerful Borgia family. The ring’s use in fictional and real life drama buoyed their popularity in the 16th through 19th centuries. Victorian 15K gold and banded agate men's intaglio ring with locket compartment. Larger locket pendants became fashionable c. 1860-1880, coinciding with increasing availability of portrait photography – for the first time, images could be created and mounted into jewelry that didn’t require the skill of a miniature portrait painter. Today, with the help of image resizing, we can put pictures into those small jewelry compartments so they may once again hold treasured mementos. French 18K gold Georgian locket with carved Garnet and scalloped edge of rose cut diamonds, c.1800. Rock crystal locket backing. Early 20th Century 14K gold locket watch fob with black enamel and a spider design set with an old mine cut diamond. Victorian 18K rose gold watch chain is hung with a shield-shaped locket containing a hinged disk of rock crystal. French Import mark c. 1838 - 1864.